A good understanding of biomechanics is a vital part of successful study and practice in podiatry, physiotherapy, sports therapy and many other areas. Yet we all know that it is not the easiest subject to get to grips with if you are not a specialist. 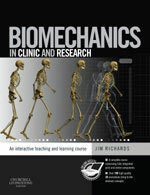 Biomechanics in Clinic & Research is a fully integrated book and 15+ hour online teaching package that solves your biomechanics problems in one purchase and allows difficult concepts to be grasped as easily as possible. • Starting with engineering concepts can be confusing, while tricky maths and physics concepts often present a real challenge if you can’t see exactly what they mean in terms of the real issues of functional anatomy. • For the student, teaching resources can be limited. • For the lecturer, lack of time can make lecture preparation a real headache. • And how can you be sure that you’ve properly grasped all those difficult principles, and can apply them in concrete, clinical situations? How do you know, if you haven’t, what you need to review? As you progress through the modules, you will come across many test-yourself questions as you go, giving you the opportunity to apply what you’ve learned and learn from your mistakes. At the end of each lesson, there is a bank of SAQs so you can really check how you’re doing, and score yourself. Better still, these questions are regularly updated, to keep you on your toes. The course is allied to a 250-page colour book, highly illustrated, and fully integrated with what you see online. The two together give you a thorough and unbeatable account of biomechanics that perfectly supplements your lectures and gives you a real headstart in this vital subject. See a quick overview of the course and try out some samples. Lecturers may be eligible for an inspection copy. Copyright © 2008 by Elsevier Limited All rights reserved.